AFC Unity is a socially progressive, multi award-winning, indie women’s football club and social enterprise based in Sheffield, UK, providing opportunities for both beginner-level and advanced women footballers in our exciting, high-energy, positive playing style, while utilising the sport for positive social change and remaining linked to – and active in – the local community. One of the few of its kind to have been created as a women’s team without being supported by a pre-existing men’s team, AFC Unity was founded by Jay Baker and Jane Watkinson in 2014 in the birthplace of association football itself – Sheffield – as an alternative football club to utilise their dedication to feminism and social justice in combination with their passion for the sport to make a positive contribution in the local community. Both have extensive experience in the community sector, running numerous projects in South Yorkshire for several years. The club name harks back to the original term Assoc. Football (or “soccer” for short), as an association football club, but in this case actually stands for Alternative Football Club, adopting the colour red to represent socially progressive ideals, and as a homage to Sheffield’s historic Sheffield FC, the world’s oldest club, as well as the surrounding South Yorkshire towns of Barnsley, Doncaster, and Rotherham, whose major teams also play in red. “Unity” speaks for itself: it represents the ethos of the club as utilising the unifying power of the sport. The club has achieved The FA Charter Standard Adult Club status and has been awarded the 2015/2016 FA Club Respect Award, took Bronze in Sports England’s Satellite Club of the Year Awards, were runners-up in the Most Innovative Organisation category at the VAS Make a Difference Awards and were also recipients of the Sports Personality Award at the South Yorkshire LGBT+ Awards. Mission statement: AFC Unity is an alternative football club for women, focused on bringing the game back to its grass-roots as a uniting force, bringing people together for the love of the game beyond vested interests and the influence of profit. AFC Unity focuses on women, as they have been historically excluded, and aims to produce and promote positive role models. Vision: AFC Unity envision a society where the football club plays an active role in its community, engaging and empowering women as positive role models, and using the sport to encourage unity, solidarity, and social cohesion. You can become a member of AFC Unity Ultras, our supporters group, for £2.00 (or £1.50 with trade union discount) a month to help support the club – read more about this here. We have one 11-a-side team playing in Division 2 of the Sheffield and Hallamshire Women & Girls League, with our home games taking place at Sheffield Park Academy and managed by Jay Baker. You can look at our fixtures here. Read more about our Red Stars here. 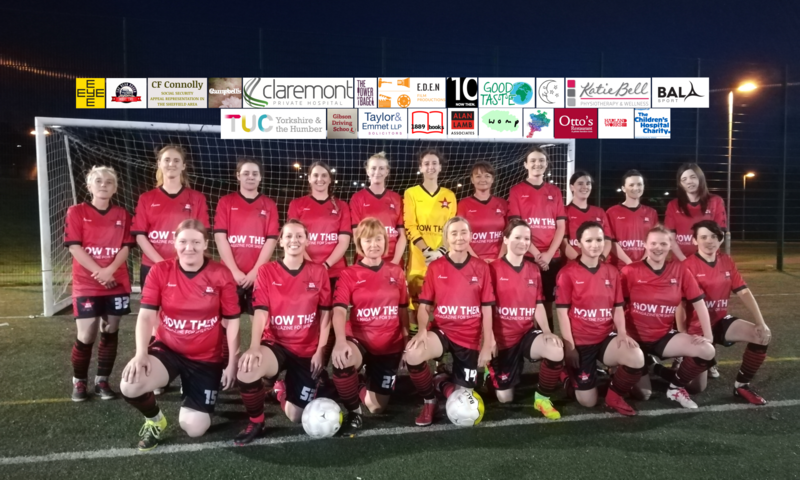 Our award-winning Solidarity Soccer initiative is our innovative, informal women’s football training engaging women (16+) of any experience and ability in non-competitive football. It is a great introduction to our alternative ethos, playing style and approach as a club. Solidarity Soccer has received funding and support from the The National Lottery Community Fund, Freshgate Trust Foundation, Yorkshire Sport Foundation, Scurrah Wainwright Charity, The Postcode Community Trust, Sheffield Town Trust and the JG Graves Charitable Trust and we are incredible thankful for this. Started as an inclusive “co-ed” concept at local parks during AFC Unity manager Jay Baker’s time in Waterloo Region, Ontario, Canada, Solidarity Soccer has been developed with co-founder Jane Watkinson to emphasise that football can be a force for good, increasing confidence in life and interpersonal skills and body image, improving health and fitness whilst breaking down barriers and divisions that exist in society. As part of this, the sessions incorporate key aspects of our Create Space project, which was about encouraging women to reclaim and use public space and break down gender stereotypes with women playing football together as a collective in a public space. We engage women who have never kicked a ball before, wanting to return after an injury or regain fitness or women who are wanting to get more football practice in. It is an innovative form of football training where we use technology and have digital awards. As part of the session, we run “Tech and Tekkers” where women can learn new footballing technical skills (Tekkers) – such as the Cruyff Turn, Stepover and the Double Dragback – with the women’s development captured using technology (Tech) to produce a short video each month. To get involved please get in contact. We ask everyone wanting to take part to complete an “Expression of Interest Form” – the related Solidarity Soccer Data Privacy Notice can be found here. We do all we can to help the club be an agent for social change and further socially progressive values and issues. Our Football for Food campaign involves encouraging players, management and supporters from both teams alongside the general public to come to our home games not only to watch a good game of grassroots football but also to bring donations of food that we then pass onto local food banks. The campaign has also been about raising awareness of the extent of food poverty, the reasons for why more and more people are going to food banks to not only help increase the donations but also tackle any misconceptions and stigma for why food banks exist. You can read more about this here. We are developing links with the trade union movement to look at tackling one of the main causes of food bank growth and use, which is low pay and poor working conditions and the benefits of trade union membership when counteracting this. You can read more about this and our #UnityForAll campaign here. Through the club, trade union members can access discounts on player subscriptions and Ultras membership. 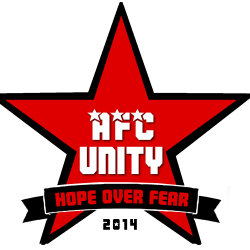 Whilst stock lasts, when you sign up for annual membership you will be sent an AFC Unity ‘Hope Over Fear’ scarf too! You can also sign up here to our general newsletter providing email updates about the club. The Newsletter Data Privacy Notice can be found here. I agree to adhere to and promote AFC Unity’s Mission Statement, Vision and Values as a member of the club. I accept that once a member of the club, failure to adhere to or help maintain the Mission Statement, Vision and Values may result in disciplinary action according to the club’s Grievance Procedure. I accept that as a member of the club that club Policies will apply to me. I accept that once a member of the club, failure to adhere to or help maintain the Policies may result in disciplinary action according to the club’s Grievance Procedure. I accept that I need to follow the FA Respect Code as a supporter/member of the club (you can read the code here) or action may be taken as stated per the code. I accept that my membership payment to AFC Unity is non-refundable. I accept that by becoming a member of AFC Unity I have read and are agreeing to follow the FA Respect Code alongside the club’s Mission Statement, Vision, Values and Policies. As an AFC Unity member, I agree to respect, uphold and adhere to the FA Respect Code, AFC Unity Mission Statement, Vision, Values and Policies anywhere within the club’s community. I have read the AFC Unity Ultras Data Privacy Notice. The AFC Unity Ultras Data Privacy Notice can be found here.